Skiing makes you hungry. But the last thing you want to do after a big day on the slopes is drive the family around an unfamiliar ski town looking for grub. You don’t want fancy, but the kids can’t handle a dive bar with burgers and beer either. Here are the best ski in ski out lunch spots and après ski dining that please our family of four skiers’ palates (and our wallets) without having to pound the pavement. 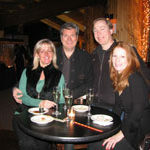 Also see our Top Apres Ski Bars in the World and Top New England Après Ski. Okemo’s Epic or Coleman Brook Tavern are proof that having a ski resort culinary department, instead of food and bev, brings a departure from standard fare. Okemo offerings are far tastier: duck quesadilla, creamy risotto, and calamari, for example. 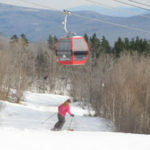 Sunday River’s Mountain Room, is the latest at Peak Lodge at the gondola summit on North Peak. 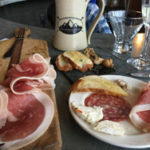 Chef Harding Lee Smith of Portland Grill Room and Corner Room has opened a beautiful bar in the lodge with small plates, charcuterie, pate, toasts and cheese plus Maine craft beers and wine with a view of the slopes. The Mountain Room offers a European style with artisanal cheeses, salads and sandwiches. 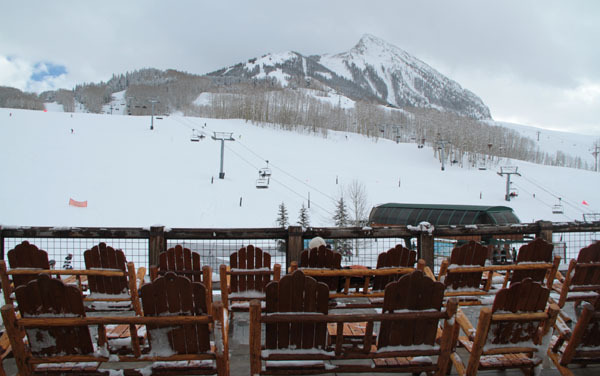 As for the perfect après ski, we love Foggy Goggle for its slope view and live music. Sunday River’s Peak Dining at the North Peak Lodge via the Chondola on special evenings is also a treat. Camp at the Grand Summit Hotel has a cozy Maine comfort food menu and log cabin inspired atmosphere. Sugarloaf’s The Bag and Gepettos are rival restaurants in the Loaf’s village offering hungry skiers hearty soups, sandwiches and super juicy burgers at pocket friendly prices. Stowe Mountain Lodge’s Hourglass is an après ski bar with a swank feel in heart of the sophisticated lodge, but you can order kid-friendly flatbreads and the best Vermont Cheeseburger reasonably. At the top of the Stowe Gondola, The Cliff House offers outstanding views and great ski lunches – like fondue. Killington’s Peak Lodge was completely replaced in 2014 – with local Vermont sourced food served at over 4,000 in a cafe style setting with couches, free WiFi and of course Wonderful views. Sugarbush’s Timber Restaurant is located in a circular post and beam lodge slopeside at Lincoln Peak. The Chef has received accolades for his Vermont ingredients in interesting dishes, don’t worry there’s a kids menu too. Verde in Stratton Village is excellent with authentic Vermont ingredients. Their après ski fondue is fabulous paired with wine from the extensive collection. 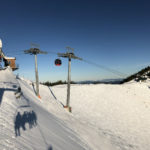 Bretton Woods‘ Latitude 44 serves up soup, burgers and superb views of Mount Washington.Witha new Presdiential Bahn gondola reaching Bretton Woods’ scenic summit, look for plans for a new lodge next season. 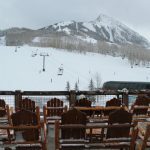 Alpino Vino at Telluride is the highest restaurant in the continent, at 11,966’ Alpino Vino mountain chalet at Telluride is reached from the Gold Hill Express for a ski in lunch, or takes a snowcat for a five-course candlelight dinner with wine-pairing. Cloud 9 at Aspen Highlands is a delightful mountain chalet at 10,400′ with views of the Maroon Bells, raclette and fondue. This place pops serious cork of Veuve Cliquot in the afternoon..
Uley’s Cabin at Crested Butte is an uber cozy mountain cabin with elegant culinary of charcuterie and gourmet cheese plates, elk and native cuisine with an international wine and beer selection. Outside Uleys Ice Bar is very “cool”. Evenings arrive at Uley’s via a sleigh ride for a gourmet candle light dinner. 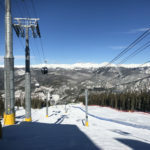 Keystone’s Alpenglow Stube at 11,444’ is amazing, this ski in ski out restaurant at Summit House offers elegant cuisine, an a la carte menu, featuring local game, fish, fowl – prepared in an open concept kitchen. 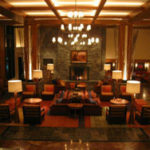 Ask for a table by the big fireplace, and check your ski boots with the hostess for cozy slippers. You may feel more feel like you are in The Alps, than Colorado’s Rocky Mountains. From Keystone’s River Run Gondola its a short ski from atop North Peak (or a brief walk for pedestrians connecting on the Outpost Gondola). At Sun Valley, dine at The Round House as skiers did back in 1939. This mid mountain lodge serves traditional Austrian fare of fondue by the fire, while an accordion player entertains with classic mountain ski songs. This is a Sun Valley must, now with its own Gondola. Summit House at Crystal Mountain in Washington is spectacular. 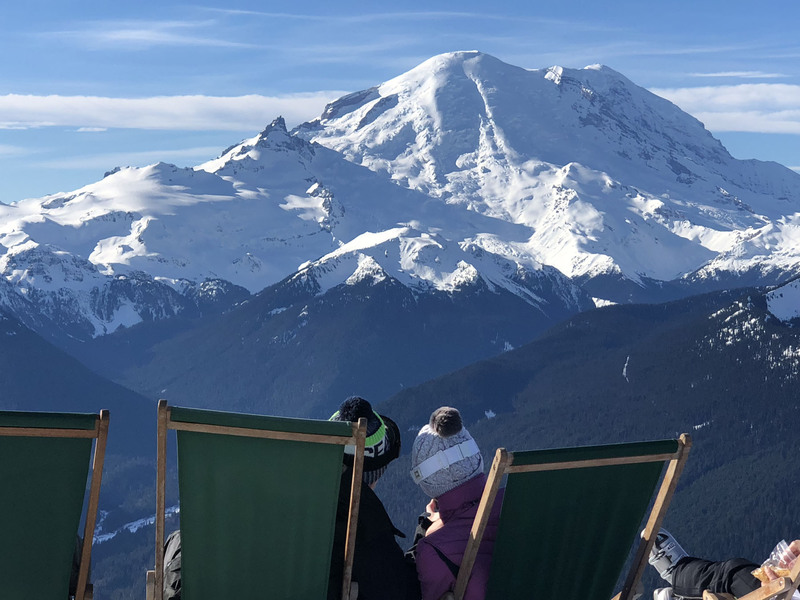 At the summit, as its name implies, this beautiful lodge offers upscale sit-down dining with a view of the Cascades and towering Mt Rainier at 14,410′. An extensive menu featuring elk, fish tacos and French Croque Monsieur, and so much more is served in a relaxed airy mountain-themed lodge. Washington wines and beers complement the fantastic cuisine and setting. Skiers will think they’re in heaven, pretty close at 6,782′. Reserve ahead, relax, and enjoy the view. 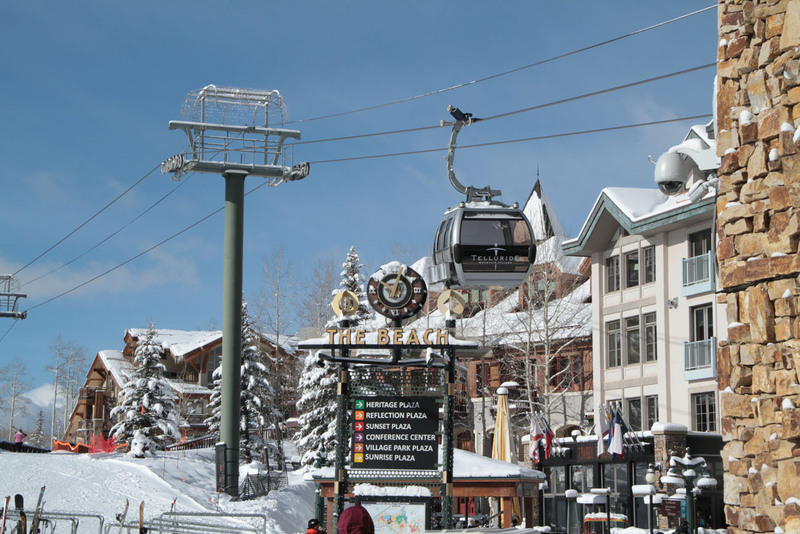 Non-skiers, or beginners, can ride the gondola to join their ski party for lunch and download after dining. Collin’s Grill at Watson’s Shelter at Alta, Utah is a surprisingly elegant mid-mountain restaurant with linen table cloths and creative courses, concluding with the Heart of Darkness Chocolate dessert. 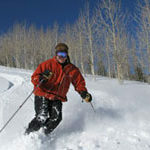 A great view of the slopes and skiers passing by on the Collins quad will keep you connected with your Alta ego. 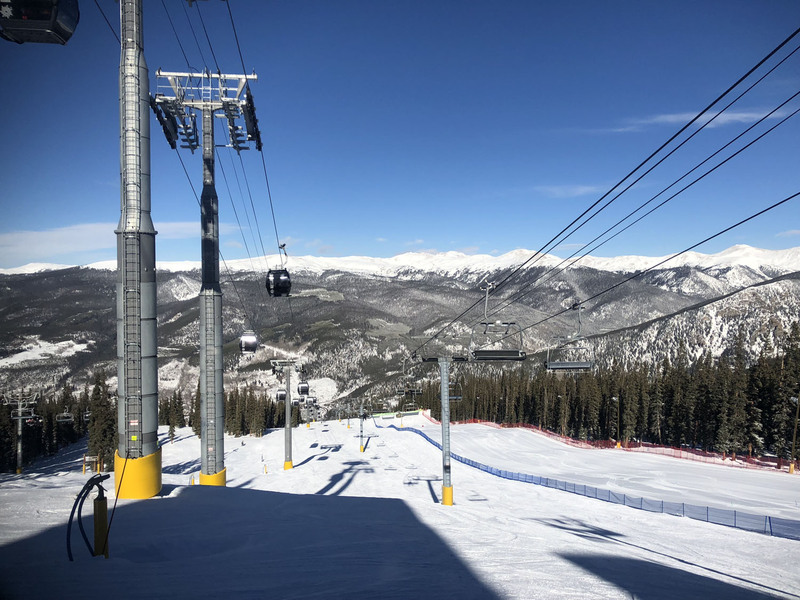 Steamboat Colorado’s spectacular on mountain dining at Hazie’s is lovely for lunch or dinner atop the gondola, while après ski at Slopeside in Gondola Village is perfect since you don’t have to ski after drinks. 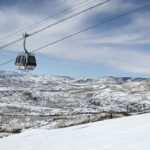 Lookout Cabin is a mountaintop chalet at Park City‘s vast resort – located mid-station of the Orange Bubble Express from Canyons Village with table service and a diverse menu for hungry downhillers. The chefs’ prepare your sashimi tuna or mountain man chili in an open kitchen but the stunning view of the Wasatch Mountains is the real attention grabber. Couloir at Jackson Hole in Wyoming is an extraordinary setting at 9,095′. Take the gondola from Teton Village to this spectacular lunch spot with views of Teton Valley and the legendary namesake run – Corbet’s Couloir off Jackson’s 4,139′ vertical Tram. Enjoy duck, elk and bison before heading back out for more big game on the ski slopes. Burgers and Bourbon at Deer Valley’s Montage is a luxury lunch with slope views and table service. Royal Street Café located upstairs in Deer Valley’s mid-mountain Silver Lake Lodge is also a table-service culinary café. The Chipotle BBQ Burger is to die for, much like Deer Valley on a powder day. 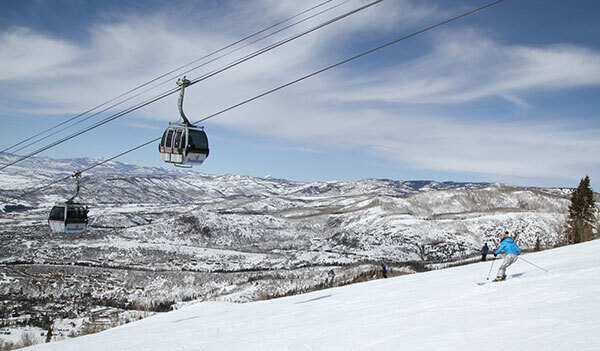 The Gunbarrel at Heavenly has location, location, location at the top of the Heavenly Tram. The fare and friendly service are a bonus, but its all about the Heavenly views of Lake Tahoe. 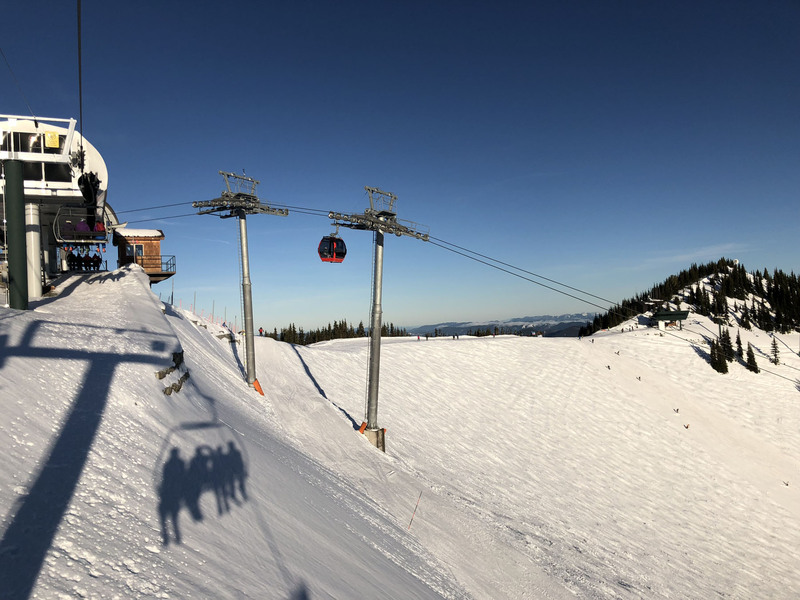 Whistler Blackcomb is legendary for its vast terrain and big vertical, and several stunning on mountain lodges -17 ski in ski out restaurants! 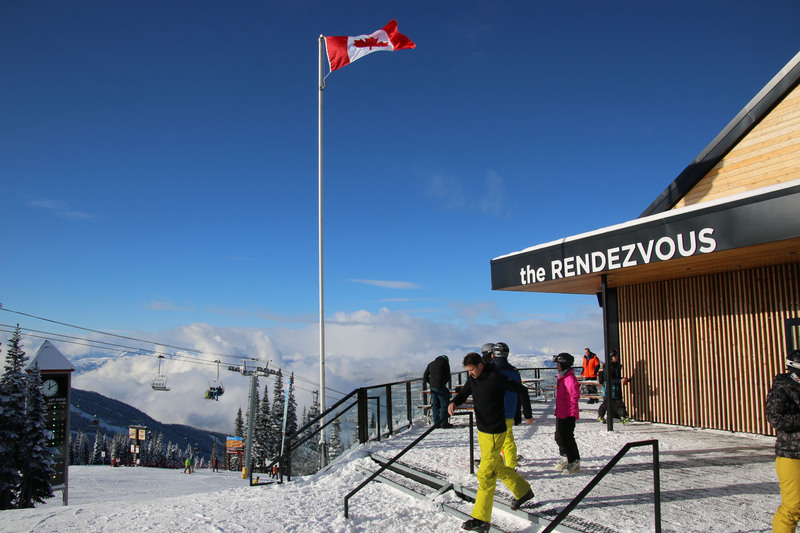 The chicest place for a ski in lunch is Christine’s at Blackcomb in the Rendezvous Lodge at 6,000’. The picturesque corner of this mod mountain lodge is a culinary treat, with elegant table service, an extensive cocktail, beer and wine list, and extraordinary food from ahi tuna to upscale fried chicken. You may just want ot stay and unbuckle your ski boots, but Saudain’s Couloir is in view for a steep post-lunch calorie-burning adventure. 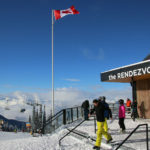 Over at Whistler, The European style Umbrella bar at The Round House is another gem, featuring a panorama and patio to die for on a sunny day, with heat lamps and a protected bar for the not-so-perfect days.